Intrinsic to all representational paintings is a quality of distance, a space between the viewer and the thing seen. 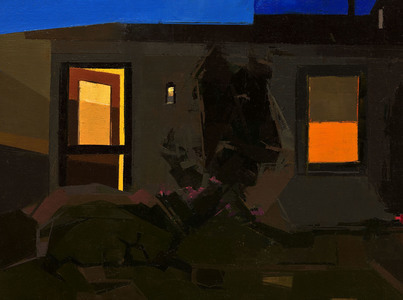 In Vectors and Blind Spots, Catherine Kehoe’s new paintings offer another kind of distance as well. Here is a psychological distance, a remoteness made palpable, playfully, by the sight of something hidden. 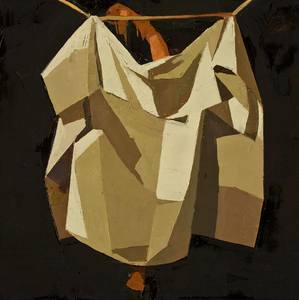 Kehoe has made a study after Raphaelle Peale’s Venus Rising – A Deception where a figure is concealed, and shroud becomes subject. Echoes of Peale’s Deception are found in Window and Window Inferno, glowing images of a view obscured. 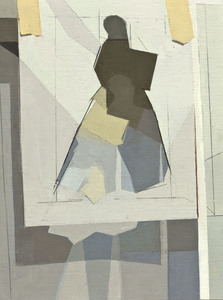 The standing figure in Orange Jumpsuit blocks a window, but the window’s severe backlighting in turn obscures her face. Faceless as well is Kehoe’s Velazquez Infanta. Moreover she is all voluminous dress, a globular form concealing any evidence of a tiny girl’s body. The Ter Borch and Ingres images show women who turn away, although we behold their succinctly rendered backs, satin and flesh. In Paper Doll, our Ter Borch satin lady retreats even more. She is a shape cut from a sheet of paper, a lively void on a studio wall. In Nocturne we behold a house in deep-hued night. We are outside, at a near distance, and we see there are lights on within. On the face of the house there is an eye-like door on the left. On the right, a window shade is a partially closed eyelid. The house looks back at us and winks. Susan Lichtman is a painter from Rehoboth, MA. She is on the faculty of Brandeis University.